Featured in over 100 publications and television shows worldwide, Mighty Mug and it's patented Smartgrip Technology is sure to excite and amaze your friends and family. 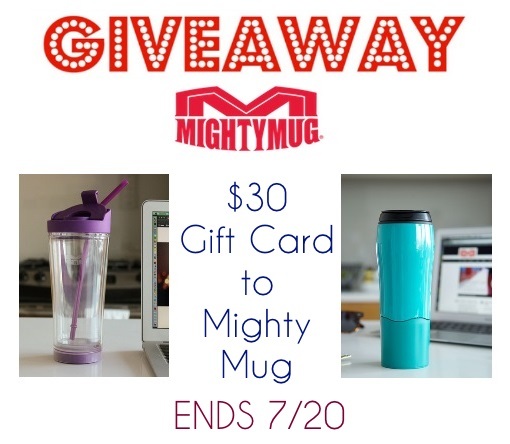 I recently received the Mighty Mug Ice in Purple and so far I'm loving it! My kids can't tip it over, my counter walking cats can't tip it over, and if I worked at a desk it couldn't be bumped over either! Honestly, as soon as I stuck it to my counter I said "GENIUS" Because it is!! TRULY is genius! And I'm so happy the Mighty Mug came into my life! BUT now one of you has a chance to win a $30 gift card to buy your own!! I like the teal mighty mug. I would get the Mighty Mug Desk in red. That is a nice looking mug. I would like to have their Mighty Mug Go SS in Stainless Steel Blue! I'd get either the Might Mug Go in Lilac or in Stainless Steel Red! Mighty Mug Go SS - Stainless Steel Silver. It's hard to choose but I think I would go for the Mighty Mug Go in silver. I love the MIGHTY MUG GO SS - STAINLESS STEEL BLUE. Since I'm going to college, I really want the mug- teal color since it's very convenient for me. I would get the Mighty Mug Ice in Purple!! I really love the MIGHTY MUG ICE: BLUE like the one you reviewed I drink more cold drinks. I like the Might Mug Ice in Blue. I like the stainless steel mighty mug in red. I like the red mug. I might choose the Mighty Mugs Ice in purple! I would get a mighty mug go in black and one in lilac. I'd choose the Mighty Mug Solo: Lilac. Thanks. Such a hard decision! I do love the Mighty Mug Ice Purple, but I also love the MIGHTY MUG GO SS - STAINLESS STEEL SILVER. I would probably choose the Might Mug Go SS - Stainless Steel Silver because I love it! I would choose the MIGHTY MUG SOLO: PINK. I really like the MIGHTY MUG ICE: BLUE. I really like the Mighty Mug Go SS - Stainless Steel Blue ! I love stainless and the color is awesome! I might choose the MIGHTY MUG GO SS - STAINLESS STEEL BLUE. I love the color! I'd get the Mighty Mug Ice: Blue! I might choose MIGHTY MUG ICE: BLUE. The Mighty Mug Ice in Purple. I constantly have a cup of ice in my hand when I'm out. I would get the Mighty Mug Go SS - Stainless Steel Blue. We have to have spillproof mugs at work and I'm always afraid I'll tip it over and spill something. i like the purple mighty mug ice!